Robert “Bob” Williams III, 43, passed peacefully Monday, February 11, 2019 with his family by his side. He fought a courageous battle with cancer, never giving up. He was born September 6, 1975 in Kansas City, Missouri to Robert Williams Jr. and Teresa (Overcash) McAlister. He grew up in Blue Springs, Missouri where he enjoyed sports and Boy Scouts. He was a graduate of Blue Springs High School. In May of 2012, Bob married Angela Sites. To this union, one son, Robert “Bobby” Williams IV was born. Bob was a hard worker, from his days delivering newspapers on his bicycle, to operating his own welding business, he always provided for those he loved. He spent years as a professional automobile painter, driving semis over the road and even restoring old cars. He always took pride in his work; this was evident in the quality of work he produced. Bob spent many hours working around his farm and helping others in his neighborhood. Friends knew they could always depend on Bob….to build fence, chop wood, do chores or share a good BBQ meal. 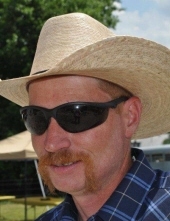 He enjoyed hunting, camping, horseback riding and sitting around a campfire with friends. Bob was preceded in death by his paternal grandfather; maternal grandparents; his mother-in-law and a brother-in-law. Bob leaves his wife of 6 years, Angie and one son, Bobby. He is survived by his father, Robert Williams Jr. (Rebecca), Overland Park, Kansas; his mother, Teresa McAlister, Overland Park, Kansas; paternal grandmother, Bea Hawley, Lee’s Summit, Missouri; sisters, Beckie Nelson, Lawrence, Kansas, Jenny (Matt) Foster, Odessa, Missouri, Crystal Simmons, Blue Springs, Missouri; two step-brothers, Bud (Tammie) Tartar, Blue Springs, Missouri and Sam Sharp of North Carolina. He will be fondly remembered by 15 nieces and nephews; 4 great-nieces and nephews; aunts, uncles and great friends. Though life dealt him a devastating blow at just 41, a diagnosis of cancer, Bob chose to fight on. Our courageous warrior selflessly gave his all, enduring many chemo and radiation treatments, surgeries and doctor visits as he battled this terminal diagnosis. Most will remember Bob for his heart of gold, his sense of humor and his old-fashioned cowboy ways. Rest easy courageous cowboy, you will never be forgotten. Funeral services were held Saturday, February 16, 2019 at the Dickey Funeral Home, Garden City, Missouri with burial in the Grant Cemetery, Creighton, Missouri. Memorial contributions may be made to the St. Luke's Cancer Center and may be sent in care of Dickey Funeral Home, P.O. Box 432, Harrisonville, Missouri. To plant a tree in memory of Robert "Bob" Williams III, please visit our Tribute Store. "Email Address" would like to share the life celebration of Robert "Bob" Williams III. Click on the "link" to go to share a favorite memory or leave a condolence message for the family.